The Large Magellanic Cloud, or LMC, is the largest dwarf galaxy that orbits our own Milky Way galaxy. It is an irregular disk galaxy that is similar in shape to the Milky Way, and we see it sort of edge on, so it looks like an oblong-shaped cigar to viewers on Earth. The LMC is about thirty thousand light-years across and 170,000 light-years away from Earth. It is named after the explorer Ferdinand Magellan (1480–1521), who in 1519 was the first European to record its existence. 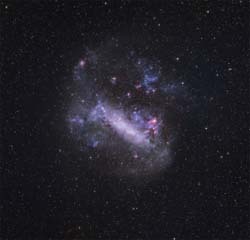 The Large Magellanic Cloud is a dwarf galaxy that orbits the Milky Way.